Joanna Berry Shields, Carrie Snowden and Harriet Terry. From this vision, Alpha Kappa Alpha became an incorporated body on January 29, 1913. 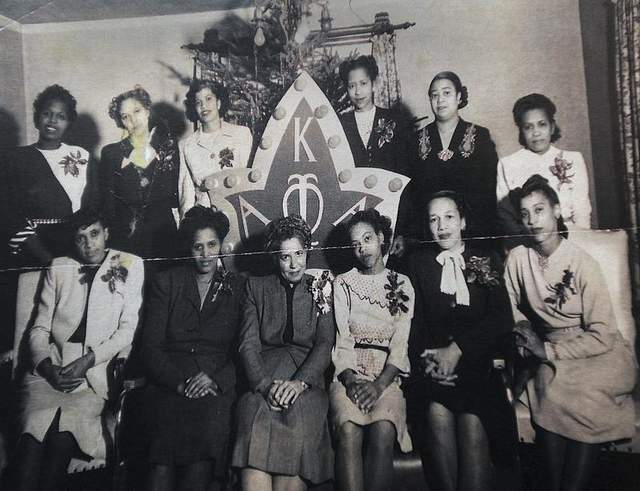 The Incorporators of our illustrious sisterhood are Norma Boyd, Julia Brooks, Ethel Jones Mowbray, Nellie Quander, Nellie Pratt Russell and Minnie Smith. Since that time, the sorority has grown into a force of more than 283,000 collegiate members and alumnae, constituting 993 chapters in 42 states, the District of Columbia, the US Virgin Islands, the Bahamas, Germany, Africa, South Korea, Japan, Canada, and on the continent of Africa. Alpha Kappa Alpha has provided inspirational leadership, enduring services, and unifying sisterhood for over a century and will continue to strengthen local communities, the nation, and the world. On December 17, 1947 in Lansing, Michigan, Delta Tau Omega Chapter was chartered with the purpose of encouraging high scholastic values and achievement, promoting ethical standards, and providing community service for the benefit of the Greater Lansing community. Specifically, the presence of Delta Tau Omega has enhanced the climate and enriched the culture for African Americans in the Greater Lansing community. Delta Tau Omega has decades of service and participation in various civic, religious, political, and educational endeavors in the Lansing community and beyond.The charter members of Delta Tau Omega Chapter are Rose Toomer Brunson, Mildred Biggs, Ivory Johnson Clinton, Marguerite Gooden, L. Margaret Groves, Violet Burch Johnson, Julia Milner, Maxine McConnell Edwards, Mary Martha Lynch, Yvette Pittman, Dorothy A. Kennedy, Mattie Russell Willis, and Ann Collins Surratt. The chapter is blessed to have one living charter member: L. Margaret Groves. Delta Tau Omega Chapter sponsors numerous political action forums, clothing and coat drives for disadvantaged families, mentoring activities for girls in the greater Lansing school districts, community fundraisers, social functions; and donates to organizations, such as, The College Fund/UNCF, NAACP, American Red Cross, and the Lansing Food Bank. The chapter was the catalyst behind the naming of the Vivian Riddle Elementary School in Lansing, MI in 1976. Moreover, Delta Tau Omega has sponsored the Graduating Senior Salute Scholarship Luncheon for over 30 years. This event recognizes the accomplishments of African American High School Seniors in the Greater Lansing area. The chapter has donated over $125,000 in scholarships to deserving graduating seniors.In 2013, Delta Tau Omega Chapter honored two of its charter members: L. Margaret Groves and Dorothy A. Kennedy with the endowment of the Keepers of the Dream Scholarship, a national scholarship through the Education Advancement Foundation, a 501(c)3 entity of Alpha Kappa Alpha Sorority, Inc. Presently, the chapter is endeavoring to endow a scholarship in honor of Dr. Olivia I. Letts through the AKA Education Advancement Foundation. Gallery – Supreme in Sisterhood and Service!